These rare breed sheep produce beautiful fleeces with a long staple length and distinct crimp. This fibre spins to a wonderfully lofty yarn with a lovely natural spring and bounce to it. The handle of the yarn makes it a joy to work with for quick and easy projects and intricate colour work alike: it slips smoothly on and off the needles without losing the strength needed for structured garments. 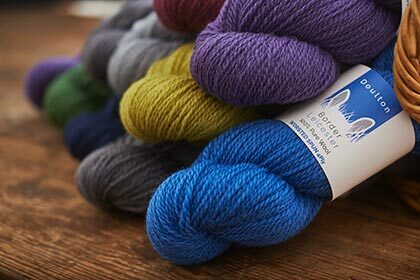 The high quality of this yarn is due to the wonderful fleeces that the sheep produce and those with a discerning eye will be pleased to know of the high level of welfare that is afforded to the flock. All with full provenance. Doulton Border Leicester yarn: High welfare, high quality.